From 2013-2015 14 long time GDS goaltenders received NCAA Division 1. commitments!! Long time GDS student and instructor Shenae Lundberg becomes the first female GDS student to turn pro!!! Long time GDS goaltender Michael Robinson commits to UNH. Congrats to GDS Goalie Maggie Emerson who had 5 consecutive shutouts as her East Coast Wizards team won the U-14 AAA Holiday Fest Tournament at Merrimack College. Maggie Emerson and the USA selects team won the Reebok Cup giving up only 2 goals in 6 games. Great work Maggie! Two GDS goalies were chosen to represent the State of NH in this month’s Make-A-Wish All-Star Hockey Classic. Ian Beliveau and Joe Grout will represent NH in the June 28th game. Awesome job and congrats to Joe and Ian!! Another GDS goaltender goes pro! GDS Goaltender Doug Carr signs with Calgary Flames affiliate Abbotsford Heat. Long time GDS goaltender John Muse has been named CCM/Reebok goalie of the week!! NH Jr. 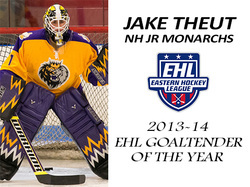 Monarchs goaltender Jake Theut named EHL goaltender of the year and commits to Northeastern!! Great work coach Moore! Tim Birarelli put together one of finest seasons in MA HS hockey history and wins Div. 2 state championship at the Garden!!! Ian Beliveau Wins NH State Championship!! GDS goalies Casey Desmith, Jeff Wyer, Doug Carr and John Gillies will be battling in the Hockey East championship games at TD Garden this weekend. GDS goalie Doug Carr names Hockey East defensive player of the week. Long time GDS goalie Michael Robinson is putting together a terrific season. Mike plays for the Boston Junior Rangers and is considered one of the top goalies his age. GDS Goalie and Prep Player of the Year Danny Tirone commits to UNH. Long time student of GDS, Danny had an exceptional season and is rewarded with a scholarship to UNH. 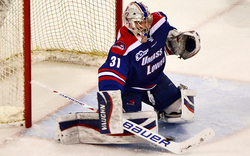 GDS Goaltender Mac Haight Commits to UMass-Amherst (NCAA-Hockey East). Mac has been training with GDS for over 5 seasons and has stayed patient and worked hard, well deserved. GDS student Sam Bernard commits to Sacred Heart University! The 6'4" net minder who led the Boston Jr. Rangers, looks at several offers and chooses SHU. GDS student Kelcey Crawford named Prep School player of the year. Once again, the Proctor MVP has a phenomenal season! GDS Head instructor and founder Mike Buckley joins the Pittsburgh Penguins.